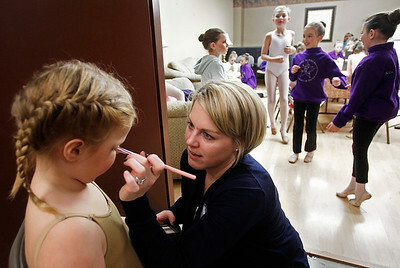 Matthew Apgar - mapgar@shawmedia.com Allison Ritt applies makeup to her daughter, Leah Ritt, 6, as they prepare for a dress rehearsal for the Nutcracker Ballet put on by The Berkshire Ballet Theatre and the Summers Academy of Dance at the Raue Center for the Arts on Thursday, Dec. 17, 2015 in Crystal Lake. Performances will be on Saturday at 3pm and 7pm, and Sunday at 3pm. 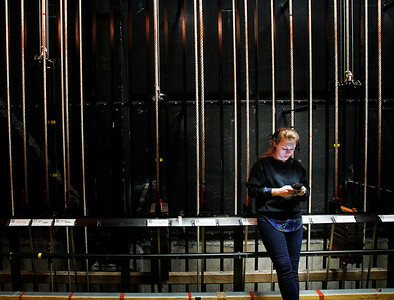 Matthew Apgar - mapgar@shawmedia.com Victoria Ross checks her phone backstage before a dress rehearsal for the Nutcracker Ballet put on by The Berkshire Ballet Theatre and the Summers Academy of Dance at the Raue Center for the Arts on Thursday, Dec. 17, 2015 in Crystal Lake. Performances will be on Saturday at 3pm and 7pm, and Sunday at 3pm. Matthew Apgar - mapgar@shawmedia.com Sydney Derbas has her makeup applied by Jennifer Beers before a dress rehearsal for the Nutcracker Ballet put on by The Berkshire Ballet Theatre and the Summers Academy of Dance at the Raue Center for the Arts on Thursday, Dec. 17, 2015 in Crystal Lake. Performances will be on Saturday at 3pm and 7pm, and Sunday at 3pm. Matthew Apgar - mapgar@shawmedia.com Chloe Atkinson and Avery Voros, both 8, play games on their phones backstage before a dress rehearsal for the Nutcracker Ballet put on by The Berkshire Ballet Theatre and the Summers Academy of Dance at the Raue Center for the Arts on Thursday, Dec. 17, 2015 in Crystal Lake. Performances will be on Saturday at 3pm and 7pm, and Sunday at 3pm. Matthew Apgar - mapgar@shawmedia.com Serena Geraci, portraying the character Clara, dances during a dress rehearsal for the Nutcracker Ballet put on by The Berkshire Ballet Theatre and the Summers Academy of Dance at the Raue Center for the Arts on Thursday, Dec. 17, 2015 in Crystal Lake. Performances will be on Saturday at 3pm and 7pm, and Sunday at 3pm. Matthew Apgar - mapgar@shawmedia.com Serena Geraci, as Clara, dances with Landan Wiley, as Hans-Peter, during a dress rehearsal for the Nutcracker Ballet put on by The Berkshire Ballet Theatre and the Summers Academy of Dance at the Raue Center for the Arts on Thursday, Dec. 17, 2015 in Crystal Lake. Performances will be on Saturday at 3pm and 7pm, and Sunday at 3pm. Matthew Apgar - mapgar@shawmedia.com Allison Ritt braids the hair on her daughter, Leah Ritt, 6, as they prepare for a dress rehearsal for the Nutcracker Ballet put on by The Berkshire Ballet Theatre and the Summers Academy of Dance at the Raue Center for the Arts on Thursday, Dec. 17, 2015 in Crystal Lake. Performances will be on Saturday at 3pm and 7pm, and Sunday at 3pm. Matthew Apgar - mapgar@shawmedia.com Landan Wiley, portraying Hans-Peter, left, and Mark Mahallak, as Dr. Stahlbaum, right, unbox a harlequin, portrayed by Sierra Pratola, during a dress rehearsal for the Nutcracker Ballet put on by The Berkshire Ballet Theatre and the Summers Academy of Dance at the Raue Center for the Arts on Thursday, Dec. 17, 2015 in Crystal Lake. Performances will be on Saturday at 3pm and 7pm, and Sunday at 3pm. Matthew Apgar - mapgar@shawmedia.com Serena Geraci, portraying the character Clara, dances with a nutcracker during a dress rehearsal for the Nutcracker Ballet put on by The Berkshire Ballet Theatre and the Summers Academy of Dance at the Raue Center for the Arts on Thursday, Dec. 17, 2015 in Crystal Lake. Performances will be on Saturday at 3pm and 7pm, and Sunday at 3pm. 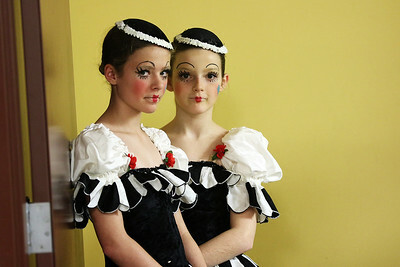 Matthew Apgar - mapgar@shawmedia.com Grace Baran, left, and Madelyn Strombom stand in a doorway dressed as Polichinelles before a dress rehearsal for the Nutcracker Ballet put on by The Berkshire Ballet Theatre and the Summers Academy of Dance at the Raue Center for the Arts on Thursday, Dec. 17, 2015 in Crystal Lake. Performances will be on Saturday at 3pm and 7pm, and Sunday at 3pm. Matthew Apgar - mapgar@shawmedia.com Harlequin Sierra Pratola, left, and Columbine Kierra Hines dance during a dress rehearsal for the Nutcracker Ballet put on by The Berkshire Ballet Theatre and the Summers Academy of Dance at the Raue Center for the Arts on Thursday, Dec. 17, 2015 in Crystal Lake. Performances will be on Saturday at 3pm and 7pm, and Sunday at 3pm. Harlequin Sierra Pratola, left, and Columbine Kierra Hines dance during a dress rehearsal for the Nutcracker Ballet put on by The Berkshire Ballet Theatre and the Summers Academy of Dance at the Raue Center for the Arts on Thursday, Dec. 17, 2015 in Crystal Lake. Performances will be on Saturday at 3pm and 7pm, and Sunday at 3pm.